Omega fatty acid, DHA, Omega-3, Omega-6, fish oil, flax oil… ACK!! Confused? You’re not alone. While most adults assume that they should reduce fat in their diets, fat is actually a critical building block for the developing brain of a child. Getting sufficient supplies of the right types of fats are important for your child’s brain growth and development. Fat comprises over 60% of the brain, acting as a primary component of the brain cell, as well as the myelin “insulation” for nerves that transmit messages between brain cells. Your baby’s brain develops at the greatest rate during gestation and the first two years of life, tripling in size over the first year. Both omega-3 and omega-6 fatty acids are necessary, however generally Western diets include sufficient (arguably, excessive) amounts of omega-6 which is found in eggs, poultry, cereals, and vegetable oils. 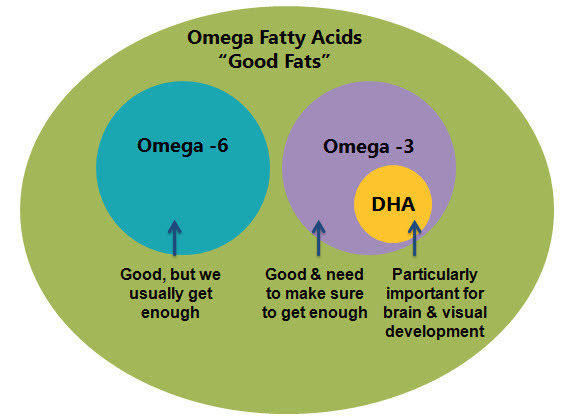 So the key to ensuring sufficient “healthy fat” is omega-3. Docosahexanoic Acid (DHA) is an extremely important omega-3 fatty acid because of its higher concentration in the brain, nervous system, and the retina of the eye. DHA comprises as much as 20% of the brain’s mass. Infants with diets supplemented with DHA in the first four months showed improved attention and faster neural processing according to studies.1 Additionally, according to the DHA EPA Omega 3 Institute, it has been determined that there is a “quantitative positive relationship between increasing intakes of DHA (per 100 mg/day) during pregnancy and the child’s IQ.” DHA is also believed to be important for visual development. And if those benefits weren’t compelling enough, DHA is being studied for potentially beneficial impacts in heart health and prevention of pre-term deliveries, post-partum depression, and attention disorders. Unfortunately, the best food sources of DHA are fatty fish, and larger fatty fish are not advisable to consume in large quantities due to risks of mercury contamination. Other healthy omega-3 fatty acids can be found in flax seeds and nuts, however, it’s important to understand that other omega-3 fatty acids such as alpha-linolenic acid (ALA) are not efficiently converted to brain-building DHA. For vegetarians, this creates a tough situation, fortunately there are now non-animal supplements such as Life’s DHA. But foods typically are better sources than supplements given the higher absorption rate. There is no official recommended daily allowance (RDA) for DHA yet. However, consensus recommendations for pregnant woman are approximately 300 milligrams of DHA, and 1,600 milligrams of total omega-3. Non-pregnant adults typically are advised to have 1,000 milligrams of total omega-3 fatty acids daily with 220 mg of DHA. However, the average American adult consumes far less than these recommended levels (closer to 100 mg daily). DHA dosage recommendations for children range from 70 to 220 milligrams. Breastmilk includes DHA, so no supplementation should be necessary for breastfed infants. Foods rich in DHA include fish (salmon, tuna, herring, sardines) and organ meats. Limit fish to three servings per week. 3 ounces of farmed Coho salmon provide 740 mg of DHA. DHA softgel supplements are available from fish oil (look for mercury-free), or marine algae (yep, that’s where the fish get DHA). Vegetarian option: Spectrum Essentials Children’s DHA Chewable Softgels or drops – I add a few drops to our kids’ milk and shake it to combine. Silk Soymilk Plus Omega 3 DHA Note: talk with your pediatrition about whether you need to limit servings. We were advised by our doctor that Silk Soymilk Plus DHA contained high levels of other fat-soluable vitamins that could be excessive for toddlers beyond a few glasses per day. Entry filed under: Health. Tags: brain development, DHA, Essential Fatty Acids, Omega 3, Omega 6. Pre-K Child Care Affects IQ, Impulsiveness of Teenagers	What’s All the Fuss About BPA?